The Northern bald ibis (Geronticus eremite) is globally threatened, listed as Critically Endangered on the IUCN Red List. It is categorised under Column A of the African-Eurasion Migratory Waterbird Agreement (AEWA) and Appendix II of the Bonn Convention. The main western population (W) occurs in Morocco, where the population now numbers 115 breeding pairs. Although precariously small, this population is maintaining relatively stability. The main eastern population (E) the relict population of three pairs rediscovered in Syria in 2002 has since deteriorated further and the wild population could now be considered extinct with just a few birds still occur in the wintering area. However, there has been significant progress over the past ten years with captive and semi-wild reintroduction trials, and a semi-wild population now exists and is increasing in Turkey; constituting a very important genetic resource for re-establishing populations in the future. The western population has two main breeding sites in Morocco, and adults and immature individuals can be found foraging within 25 km of th sites by February each year. During the non-breeding season the vast majority of remaining birds still feed and roost within the boundaries of the National Park and within 25 km of the coastal breeding sites near Agadir, regularly changing between the two sites. 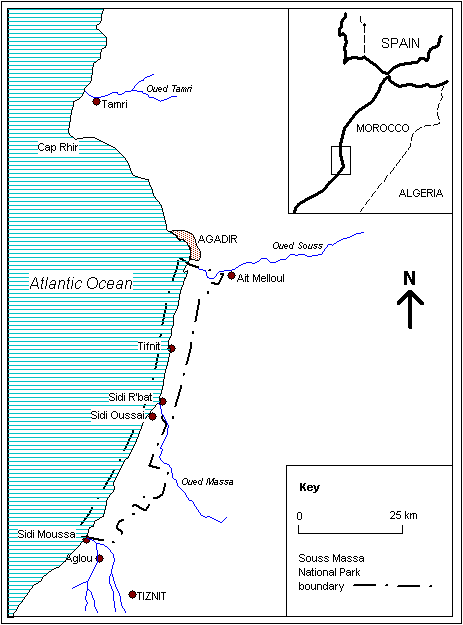 Historical records strongly suggest that the now extinct populations from further north in Morocco (primarily Atlas and Middle Atlas ranges), and very probably including the small former population in Algeria, were more migratory than the two remaining colonies, and regularly wintered further south even as far as Mauritania and Mali. Knowledge of juvenile post-breeding period dispersal is not yet fully understood. However, a limited number of birds do move hundreds of kilometres to the south along the coast. In the Eastern population satellite tagging of birds in Syria has helped map the migration route (Lindsell et al. 2009) and how the birds move very quickly South in June and July, spending a few weeks in Saudi Arabia and Yemen, before crossing the Red Sea to the Ethiopian highlands in August for the non-breeding season. Although there is less data supporting this Juvenile and sub-adults (at least in recent times) appear to spend this time moving within the Arabian Peninsula (Saudi Arabia and Yemen) and it is possible that some may even linger further North which may expose them to higher mortality risks including illegal hunting (Serra et al. 2014). It should be noted that Jordan, Eritrea and Sudan also regularly host the migrating birds, but only very briefly.